Do you have movies that you've watched over and over? Can you quote entire scenes of dialogue? Do you know every word, every gesture, every look? That is how I feel about Pride and Prejudice. 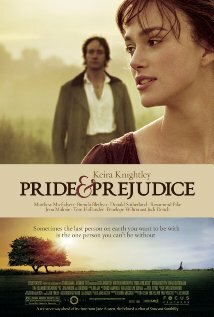 My favorite version is the 2005 adaptation with Keira Knightley, Matthew Macfadyen and Donald Sutherland. I never tire of watching this movie---in fact I have watched it so many times my husband sometimes requests it. Ok, he only requests it when he wants to take a nap because he says it is the perfect background noise to sleep to, but it's a request nonetheless! Me too, Gaby! I literally know every word. I never get tired of it and it's my go-to feel-good movie! I get to hang with Meg, I love me some Kevin Kline, and I get to see Paris. Juju, I haven't seen that one! Need to remedy that immediately!! French Kiss is cute!! I like Pride and Prejusice and Kate & Leopold but my new go-to-feel-good-waanna-laugh-at-crude-humor favorite movie is PITCH PERFECT!! ... in the words of Fat Amy, CRUSHED IT!